St. Johns encompasses the better part of the North Portland peninsula between the Willamette and Columbia Rivers and boasts its own rich and interesting history. James John, an 1843 pioneer settler of Linnton, Oregon, moved across the Willamette River and established St. Johns around 1865. While St. Johns remained a separately incorporated city for many years, it officially became a part of Portland when it was annexed in 1915. Thankfully, the small-town-feel is still predominant, with Lombard serving as the neighborhood’s main street, and the old St. Johns City Hall has been converted and is currently being used as a police station. While streetcars were a standard form of transportation, they’re now a thing of St. Johns’ past, however many older houses and buildings of historical interest still remain. 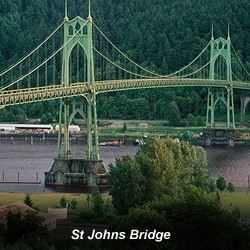 The most notable structure in the North Portland, Oregon real estate area is, of course, St. Johns Bridge. A steel suspension bridge completed in 1931, it is arguably the most beautiful of Portland’s links across its rivers, connecting the north peninsula to US-30. The bridge’s beauty tends to be mostly appreciated by the local residents, as St. Johns Bridge lies a few miles west of downtown, so unfortunately visitors to Portland rarely see this designated historical landmark. And though it looks a bit like the similarly designed Golden Gate Bridge in San Francisco, and is often mistakenly thought to be from the same designer, it was in fact the creation of David B. Steinman, a rival to the builder of the Golden Gate. With 400-ft Gothic, Cathedral-like towers and a main span of 1,207 feet, it was a huge structure for 1931, and at the time, dwarfed the other Portland bridges by comparison. North Portland is considered a traditionally working-class area and supports its locally owned businesses with a passion. While shopping and dining, you may come away with the feeling that locals enjoy St. Johns just the way it is, however, long-time residents are facing some inevitable changes, and indications are already clearly visible in the main business district, which centers on North Lombard Street at Philadelphia Avenue. Established hangouts like Tulip Pastry Shop and their 60-year-old recipes (the baked goods are fortunately fresher) seem contrary to newer offerings such as vegan-focused Proper Eats Market and Café and Anna Bannanas coffee shop. Across the street, you’ll find the St. Johns Historic Twin Cinema and Pub, where they show first-run movies at discount prices. For a “reel” deal, the McMenamins St. Johns Theater and Pub shows second-run movies at even cheaper prices. There are plenty of parks and natural areas in and around the Portland area to enjoy, no matter what your interests, and North Portland is no exception. From Smith and Bybee Lakes, the wildlife sanctuary between the lakes, and Woodsy Pier Park on the northern side of St. Johns to Cathedral Park just under the St. Johns Bridge and Forest Park just across the river, you’ll find gardens, hiking trails, boat docks, and a wide range of sporting activities. From Kelley Point Park, at the northern tip of the peninsula, you can spend hours watching in awe at the confluence of the Willamette and Columbia Rivers. Check out all of the North Portland's parks and even narrow your search by the amenities you’re interested in at www.portlandonline.com/parks. In keeping with the Portland neighborhood’s working class roots, you’ll find that North Portland, Oregon real estate tends to be more modest. Ranch-style homes, Cape Cods, and small cottages predominate, but you will find a few older bungalows and Victorians mixed in every now and then. The adjacent Cathedral Park neighborhood, named for its park along the Willamette River that lies under the Gothic, Cathedral-like eastern piers of St. Johns Bridge, is technically a separate neighborhood, but is considered very much a part of St. Johns due to its proximity. There are six elementary schools, one middle school, and one high school in St. Johns as well as an alternative education program that can be checked out at www.stjohns.edzone.net. Getting around North Portland is fairly easy and those who live close by the downtown area can choose to walk to the nearby restaurants, shops, theatres, and post office. The St. Johns Bridge offers an easy 10-minute commute into downtown Portland, but for those who find that by bus is the way to travel, TriMet offers a convenient and affordable option: trimet.org.